National Trend 'Mobs' Local Businesses With Cash In a "flash mob," hundreds of people invade a public space to do something in unison. But a "cash mob" adds a mission to that idea. 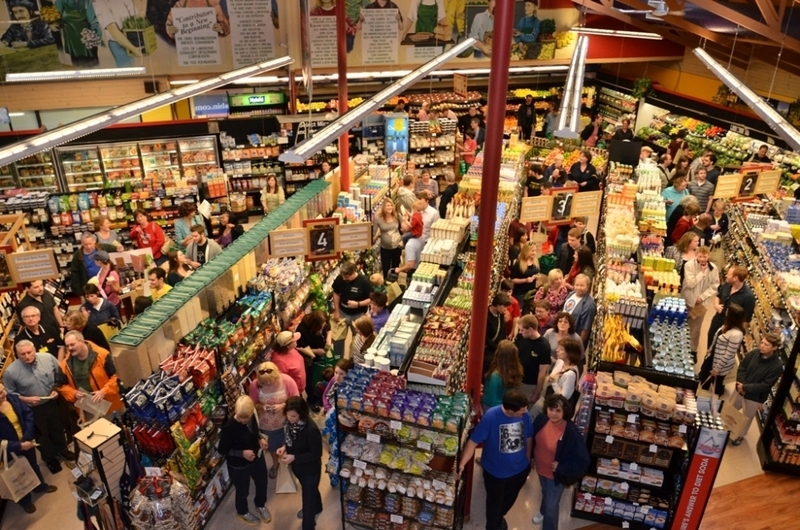 All over the country, crowds of people are being organized on social media sites to invade mom-and-pop stores at a specific day and time to spend money locally. Members of Cleveland Cash Mob shop at the Nature's Bin grocery store in Lakewood, Ohio, during a cash mob event Saturday. You may have heard of "flash mobs," where a mass of people invade a public space to make a scene. Now the idea has been turned on its head by "cash mobs," where large crowds of consumers show up at small businesses to spend money. But it's not just about propping up the local economy. Cash mob is good for any downtown little local business. We're dying. We're dinosaurs. It's 5 o'clock on a Friday, and mostly quiet in the Lander's Men's Store, a mom-and-pop clothing store in Jamestown, N.Y. But shop owner Ann Powers is anticipating a mob. "You get kind of nervous thinking, 'Oh, nobody is going to show up,'" she says. "Or else maybe there'll be so many people that the police will have to monitor." About three dozen people turn out. "I actually bought a little tie for my son," says first-time cash mobber Tiffani Conti. "So, yup, everybody seemed to walk out of the store with something." Lander's was chosen by the mob through a vote on its social media accounts. Powers says she feels lucky because this infusion of new customers helps her store stay afloat. "Cash mob is good for any downtown little local business," she says. "We're dying. We're dinosaurs." The idea started last fall when Buffalo blogger Chris Smith envisioned using the purchasing power of flash mobs to help small businesses. Among the few ground rules: Each person should try to spend $20 and pay full price for items. He says this sets cash mobs apart from other social media deals. 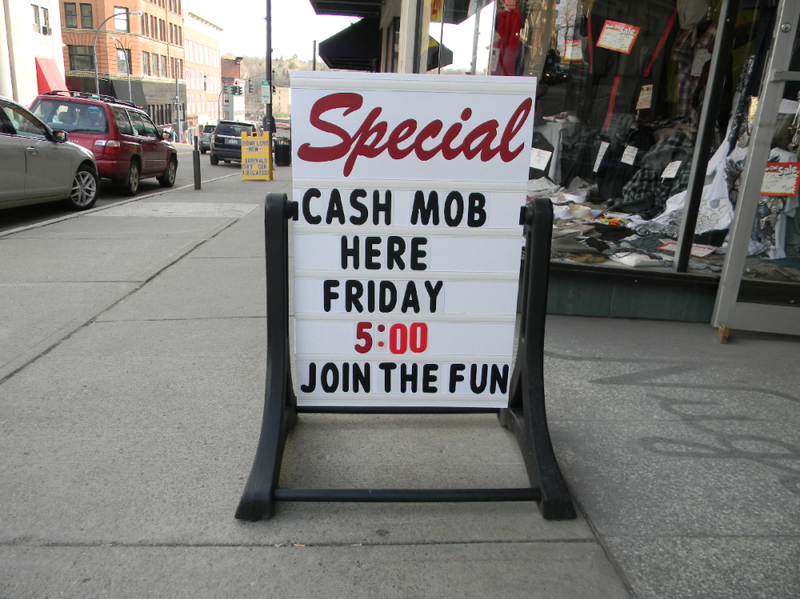 Lander's clothing store in Jamestown, N.Y., prepares for a "cash mob" to descend last week. "What you get with a Groupon or a Living Social deal is a one-time injection. And it's not necessarily a profitable injection," Smith says. "You're having to cut your prices so significantly. I think with this, because we ask people to come and spend a little time in the store, we encourage the entrepreneur to spend some time with each of the shoppers and introduce themselves, talk about the products they have. It builds a relationship that you don't get with a coupon." Nearly 200 cash mobs have cropped up in 35 states and a handful of countries, mostly through word of mouth online. Andrew Samtoy runs the national Cash Mobs blog from Cleveland. He says the idea has spread so quickly because it's not just about helping small business. "We're consciously using social media to get people to actually be social," Samtoy says. For example, Cleveland's group has a rule that every mobber should try to meet at least three new people. Samtoy says these events bring strangers together to rally around a common cause. "In this day and age people are counting the number of friends on Facebook or Twitter and thinking that that somehow relates to the number of friends they have in real life," Samtoy says. "We want people to actually get out from behind their computer screens and meet face to face and form what could be considered a real community." But Chris Smith admits cash mobs might be another fad, since technically no one's in charge of the movement. Each local mob will determine its own way forward, he says. "The best way to let something grow is to not worry about it," he says. "Let people take ownership of it and do it the way that works for them. And as long as you stay true to the original concept, I think you're always going to be successful." Which means anyone can plan a cash mob anywhere, anytime. But Smith recommends calling the business first just to make sure it's OK.